In order to avoid this problem the objects using the SDE.ST_GEOMETRY type have to be dropped before dropping the SDE schema. Also the drop user SDE cascade should not be used. sometimes when you try to recompile an oracle object such as a “package” for example using the command line in “sqlplus”, you face a message that compiled with errors. in sqlplus , the prompt states “no errors found”. while actually there are errors and issue with the oracle object, to resolve this either check this oracle object under the schema using TOAD or sqldeveloper and go the “errors” tab and check what exactly is the issue. Where [schema_object] is the name of the schema user. When i wanted to upgrade my ArcSDE Geodatabase from version 9.3.1 SP2 to 10.1 SP1. I ran the pre-requisite tool which scanns fully my geodatabase and stated the scan passed successfully and your geodatabase is ready for upgrade. Server tables and stored procedures are up to date. The geodatabase system table could not be created. [GDB_Items : Error (-51)]Unpaused the database. so, at the begining i though it could be something related to “missing privileges” , which was NOT !!! The errors seems to me to reference two issues (st_spatial_index issue) and (CTXSYS which is the Oracle Text). The first thing i have performed is to re-validate my Oracle Text Component, which was performed successfully. after examining the GDB_items table in another ArcSDE Geodatabase version 10, i found out that the table has a “domain index” associated with it being created by an indextype named st_spatial_index . 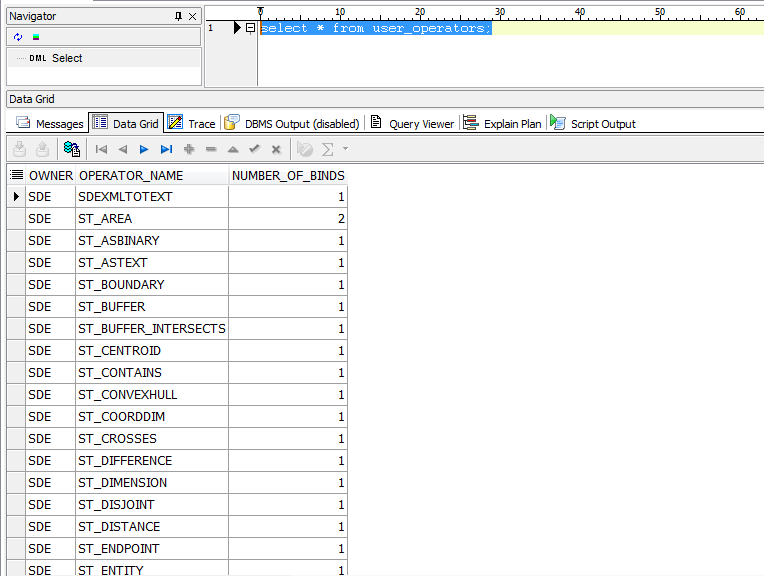 sooo BOOM i found the real issue which indextype is for some reason missing from my Geodatabase !!! so the inextype could not be created because there are missing “operators” for some reason ??!!! after comparing the two lists, i found out the “missing” operators and i have created them. I re-ran the upgrade again, and it was SUCCESSFUL ! While performing an ArcSDE Upgrade from your ArcGIS Desktop (ArcCatalog), you can check your local logs form more insight information.